As a nuclear crisis hangs in the balance in Japan, symbolism and mythology surrounding the environmental threat gain significance. The slip into an atmosphere of uncertainty begins with strange gekokujō (下剋上) moments, with challenges to conventional, contemporary officials and moral appeals to traditional authority. An illustration comes from the Emperor of Japan's annual spring garden party in the Akasaka Imperial Garden in Tokyo. At the party, the Emperor politely asked Governor Murai of Miyagi Prefecture what workers were doing, exactly, with radioactive debris. Were they disposing of it carefully? Hard to say. In Minamisōma, Fukushima Prefecture, in February and March 2012, there was talk of mysterious black dust everywhere, which had never before been seen. On 27 April 2012, it was officially confirmed that the dust contained plutonium 238, 239, 240, 241 and strontium 89 and 90. It also has huge levels of radioactive cesium 134 and 137. One concerned city official remarks that all the black dust has "blown away." You can see his video of local dust storms, here, and his blog here. Then there is this little piece, about Kindergarten children who were engaged to wipe down low level hot spots, namely mailboxes, in Ryozen-machi district of Date City in Fukushima Prefecture, 50 kilometres (31 miles) from the ruined Fukushima I Nuclear Power Plant. Radiation rates are about 1 to 3 microsieverts per hour, with higher doses here and there, which occasioned previous recommendations that the city's children stay inside. For reference, in May 2011, the Japanese legal radiation level under which under-18s were allowed to work outside was 0.6 microsieverts per hour. You can see a discussion about safe levels of radiation in Japan, including the comments section which has many links, here. On the other hand, a comment from the American Association of Physicians and Surgeons provides an opposing view, and dismisses the dangers of low dose radiation, here. The polishing of mailboxes was done on 20 April 2012 to commemorate Japan's postal service. New ways of dealing with fallout in Fukushima Prefecture, 21 April 2012. Image Source: Fukushima Minyu via EXSKF. Image Source: GoogleMaps via Common Dreams. Common Dreams has a piece on the Natural Resources Defense Council's assessment of potential areas of fallout risk in North America around American nuclear power plants. 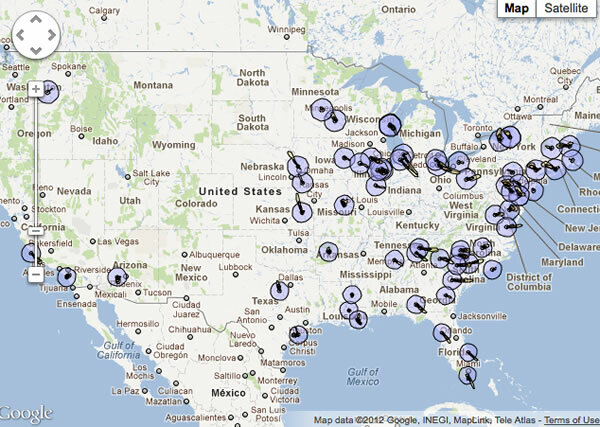 The NRDC allows users to enter their zip code (here) to call up a Fukushima-like projection around their nearest plant. It is the kind of thing that frightens people, but then again, the news out of the nuclear power industry is not very encouraging these days. Alarmist Preppers claim that North America is being hit with vast amounts of fallout, which they insist is being covered up by the government and mainstream media. On the other hand, they confront the remarkable counter-factual logic of those who still think that nuclear energy will reduce humanity's carbon footprint. On 20 March 2012, Olivia Fermi argued for the Vancouver Observer that, "Nuclear energy [is] still looking good for climate change reduction post-Fukushima." One commenter thanked Olivia for championing, "clean nuclear energy." In the one year since the Fukushima nuclear disaster began, the Nuclear Regulator[y] Commission (NRC) has failed to enact any safety mandate for U.S. reactors, an oversight the Natural Resources Defense Council (NRDC) says is making 120 million Americans at an increased risk of radioactive impacts. The group's new U.S. nuclear fallout map shows the risk factors associated with the nation's plants and the radioactive plumes that would have occurred had an area been hit with a Fukushima-like disaster. I have an earlier post, here, about a leak at the Grand Gulf Nuclear Plant in Mississippi in 2011. There were further problems at Grand Gulf in February 2012. The NRC recently penalized Fort Calhoun, Turkey Point, Florida and Catawba, South Carolina plants for violations. In March 2012, the NRC granted construction approval for two new nuclear plants in South Carolina. And on 10 April 2012, a report circulated on the Web that the US Military was stocking up on Potassium Iodide tablets to protect troops from radioactive fallout. 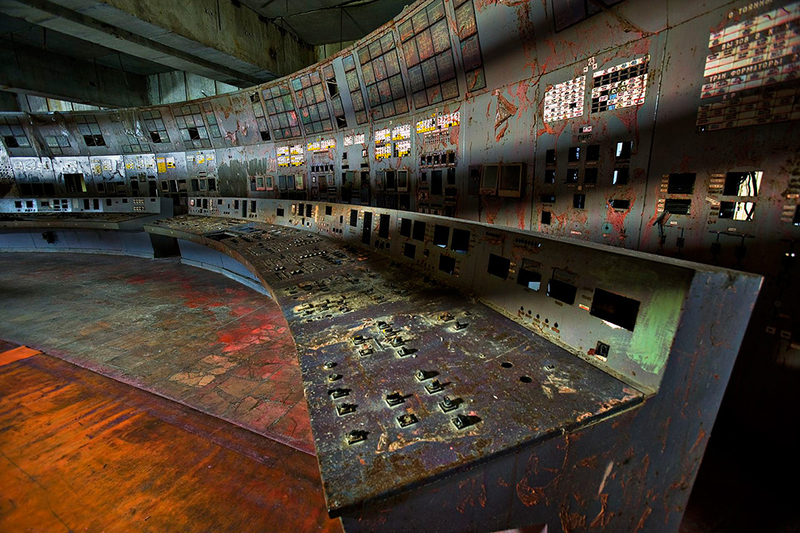 Control room in Chernobyl's Reactor #4. Image © (2005) Gerd Ludwig via Boston Globe. Today is the 26th anniversary of the Chernobyl nuclear disaster. Alla Yaroshinskaya, former Deputy to the USSR Supreme Soviet summed up the outcome: "The most dangerous element that came out of the Chernobyl reactor wasn't Cesium or Plutonium, but lies. The lie of '86, that's what I call it, a lie that was propagated like the radioactivity throughout the whole country and the entire world." Above, the control room of Chernobyl's Reactor #4 mirrrors worries about Fukushima's Reactor #4 (a number considered to be bad luck in Asia). In 1986 and 1987, 240,000 liquidators and support workers passed through Chernobyl to contain the crisis. They were called biorobots. Ultimately, 600,000 people were recognized for their clean-up work; and according to the IAEA, there were 100,000 more who went unrecognized. Greenpeace claims that there was a total of 800,000 liquidators. National Geographic has some photographs of these workers here. The IAEA sees no direct correlation between their radiation exposure and their later cancer rates. Perhaps 40,000 are dead now, and some 100,000, now in their forties, are disabled and suffer from unending health problems, with about 4,000 dying every year. Their children exhibited a seven-fold increase in genetic mutations. Their predicament has not been systematically studied or fully acknowledged. The debate on the number of deaths caused by the accident is inconclusive to say the least: Chernobyl's total number of deaths lies somewhere between 43 people and 1 million people. The liquidators' efforts cannot be underestimated; they prevented a second explosion and China Syndrome at Chernobyl, which could have rendered Europe uninhabitable. 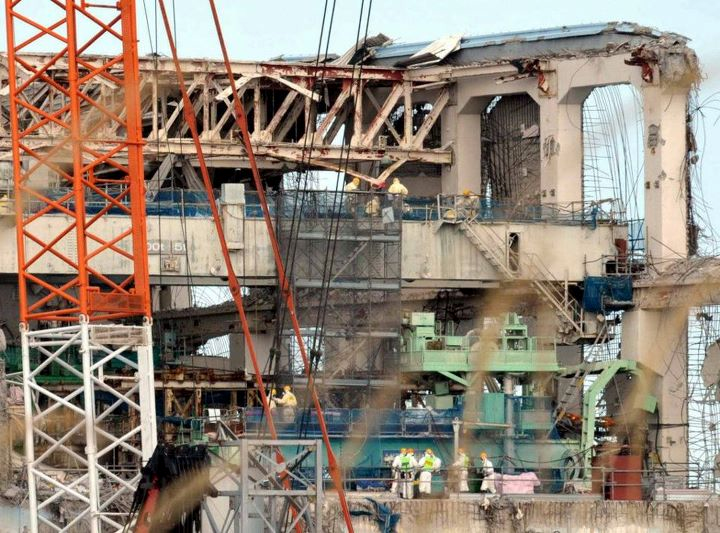 The sheer size of the workforce, the speed at which they had to work, the resources they needed, and the costs involved to contain the fallout at Chernobyl all make Fukushima's smaller, valiant total workforce at the one year point of around 18,000 extremely worrying. Chernobyl is widely considered to be one of the key factors which brought down the Soviet Union. The main medal (here) given by Soviet authorities to liquidators features a drop of blood irradiated with alpha and beta particles and gamma rays. First responders additionally received a medal with Lenin on it. There are various other medals for special workers, such as firefighters, and anniversary medals (see also here). One commemorative medal features a pregnant woman on one side and a Chernobyl clock on the other. According to Wiki, liquidator medals have been available for sale since the 1990s in Belarussian, Ukrainian and Russian markets. As their recipients died, some medals were sold by surviving family members. They are also sold on the Internet by antique dealers. Mythology, water spirits and radiation: Chornobyl (Artemisia vulgaris) roots were traditionally used to banish Slavonic water nymphs, or rusalky. 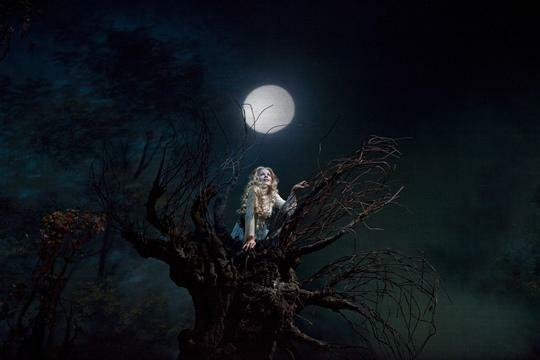 This is: Renée Fleming singing Song of the Moon in Dvořák's Rusalka in a NY Met production. In folk medicine, overdosing on Chornobyl roots led to memory loss. The Chernobyl disaster (described in this excellent documentary) has not just engendered lies. It has also become interwoven with popular culture and Biblical, Renaissance and Millennial eschatologies. It is, in fact, an object lesson in how engineering and scientific failures can easily and rapidly enter the realm of myth, symbols, superstitions and religious dreams. With Chernobyl, it happened almost immediately, starting with a July 1986 article in the New York Times, which associated the name of the exploded nuclear reactor with the Wormwood Star in the Bible's Book of Revelation. In this post, I trace a winding, very strange road to follow how the religious and linguistic etymology of the word 'Wormwood' contributed to the mythologizing of this nuclear event.